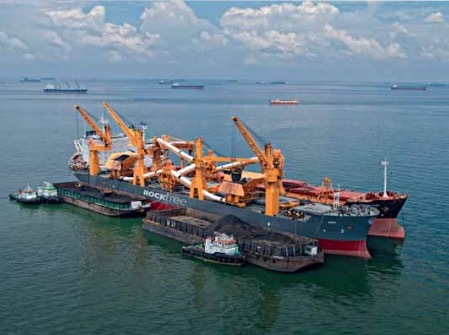 The Singapore-based shipping and logistics company Rocktree offers logistics solutions to dry bulk commodity producers, end users and international trading companies in the natural and mineral resources sectors. Through its fleet of offshore floating terminals (OFTs), Rocktree is able to provide transshipment services, storage, cargo blending and ship management services to clients in emerging markets, greatly simplifying the supply chain process. In commodity-producing regions around the world, the need for sophisticated and reliable supply chain solutions is essential. For Rocktree, the company’s goal is to offer modern, highly customized logistics solutions for their clients dealing in the transport of dry bulk commodities, specifically coal. Rocktree’s fleet supports coal companies throughout the supply chain, offering solutions to producers, end-users, and logistics providers. Rocktree’s OFT vessels provide the standard transshipment services that many service providers offer clients in such markets; it also provides storage, which is not standard. However, according to Pratolongo, Rocktree offers another key differentiating service. This specific service is the centrepiece of Rocktree’s strategy to offer unconventional solutions to players in the coal industry. Rocktree has three assets for such operations, Zeus, Mara and Apollo. The Apollo has recently been commissioned, and started operations in July this year. She is designed in order to achieve loading rates over 40,000 metric tonnes/day with latest technologies available for homogeneous blending and automatic mechanical sampling services. Apollo also has a buffer storage of about 3,000 metric tonnes. Apollo was built according to stringent environmental requirements and has been awarded with the Green Star 3 Design additional Class notation, the first time such a recognition has been granted to this type of floating terminals, highlighting Rocktree’s commitment to the environment. Designed to withstand higher loading volumes, these vessels enable clients to load greater quantities of cargo on board in a time-effective manner, significantly reducing daily operating costs and time spent at sea.